The 4th Karachi Photo Walk was held on 22nd December 2013, which started off from Jehangir Kothari Parade at Clifton, and ended there only. The walk was sponsored by Gloria Jeans Coffee and The Burger Factory both of whom were conspicuous by their absence. In between there was an extremely brief walk to Abdullah Shah Ghazi Mazar with no one allowed to come even close to the place. Experienced photographers were used as trainers for all the four groups who helped the people will all aspects of taking shots. The trainers were more than willing to help each individual even if he didn’t belong to his group. Karachi Bikers Group was called in to provide some interesting photo-ops. In the process the group got its 15 minutes of fame as well. The facilitators for each group were pretty much non-existent. They only came alive when the head count was being done at the time of boarding the coaster. Otherwise they were probably smoking pot somewhere in the bushes during the action. There were more people than the three coasters arranged could accommodate easily. It was like the school bus from hell, where all the kids are jampacked into a small confined place. Considering that you’re charging a whopping Rs. 1500 from each participant for a mere walk, surely an extra van or coaster wouldn’t have put a dent in your wallet. There were no security measures, in spite of that being mentioned up front. The ‘refreshment’ was the funniest part of the walk. By the time we reached Frere Hall with a sinking feeling that this was going to be as good as it gets, it was about 4pm and we were thinking that perhaps the lunch or refreshment would be the redeeming part of the walk, considering that Gloria Jeans Coffee and Burger Factory were the sponsors of the event. And what do we get? Take a wild guess. Biryani, you say? Even that would look like Mon Salwa compared to what we actually got. Dilpasand’s lunch box. Only that it wasn’t a lunch box. Looked like one. But ‘khoda pahaar aur nikla chouha’. 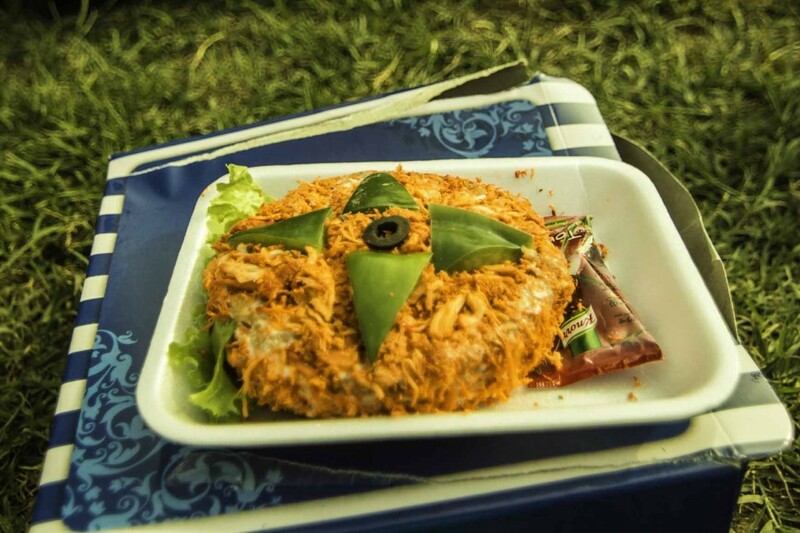 There were two items within it: a chicken roll and a colorful circular disk from outer space which was filled with chicken and ‘saunf’- a cross between a pie and a ‘pan’. Yeah that’s how queer it was. I was half expecting to come across a ‘chaalia’ on one of the bites. After wolfing it down, one of the trainers himself remarked that he was through with the appetizer, where was the main course? Action started one and a half hours late, mostly because the organizers couldn’t get their act together. And if that wasn’t bad enough, the process of boarding the coasters and then waiting for the lethargic facilitators to do the head count for each group was excruciatingly slow. Half of the event time was spent on getting on or off the vehicles. If only the organizers had the sense to arrange four coasters, one for each group, the whole process would have been streamlined and managed in half the time. Not only were the initially promised venues not covered, they couldn’t even keep their word on the back-up plan. Initially they had planned to start from Jehangir Kothari Parade Clifton, take a brief walk towards Abdullah Shah Ghazi, board the coasters and go to I.I Chundrigar Road. Then they changed plans to go to Zero Point or Do-Dariya. Then there was also the plan to capture Harbor Front – the building housing the Dolmen City – from a distance because due to security measures, you’re not allowed to take a shot within 30 m from the building. Instead we ended up on Seaview, then went to Frere Hall and then just came back to Ibne Qasim park. The flaw with this plan? All these places are those that you can easily cover on your own safely without the need of an entourage. There was just a small mineral water given at the outset of the walk, and after that not a single drop of water was offered, no juices or drinks, not even when the legendary Dilpasand lunch was served. Where were you Gloria Jeans Coffee and Burger Factory? The group was not allowed inside Frere Hall, the inside of which is a photographer’s delight. In fact a chowkidar at Frere Hall was ready to lathi charge the entire group saying photography wasn’t allowed on the premises. And this just goes on to show the organizer’s lack of coordination with the authorities/management of the places being visited. This would have made a real difference in the event being perceived as a success or failure if at least the beauty of Frere Hall was allowed to be captured without any hindrance. I spoke to a couple of participants that were there in the previous editions of Karachi Photo Walk as well as to one of the trainers himself, and they unanimously judged it as the worst of the four. But again the ‘worst’ is a relative term here. Those who were participating in a photo walk for the first time or those that had little or no idea of how to use a DSLR, it was a good experience for them because the trainers were no doubt really helpful. What’s more the Canon Gang members were also pitching in with their advice wherever possible. However, for those that have a bit of an experience with DSLRs or have already participated in previous walks, for them it was a big disappointment. 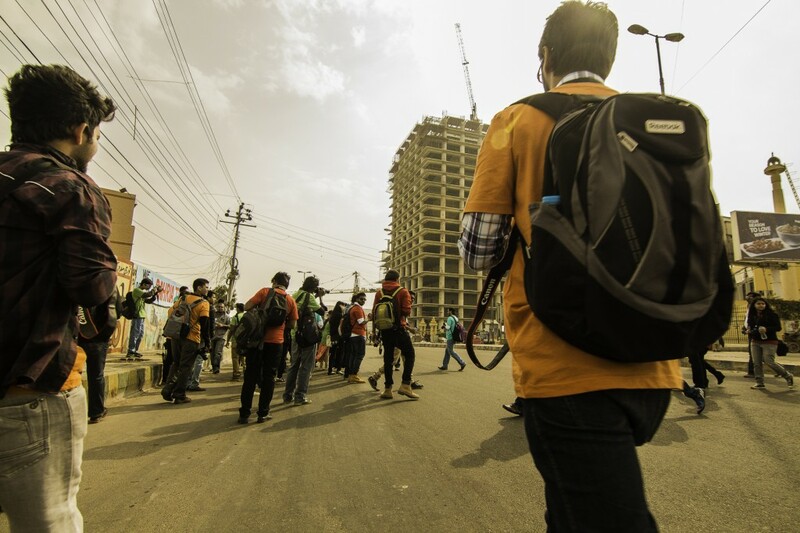 That’s because this group joined the walk because they expected it to give them access to those areas of Karachi where they would never dream of capturing shots with their DSLR alone. Ok maybe they could, but it would be more of a nightmare where the DSLR vanishes into thin air as soon as it is taken out from its cocoon. If you’re going to be taking them to places they have already captured and won’t tell them about the venues beforehand, surely they have a right to be pissed off. Karachi is brimming with places of architectural significance. There’s Mohatta Palace, Empress Market, Tower, churches in Saddar, Radio Pakistan building, Kemaari, Manora – the list is endless. There was a protest by MQM on that day near the Press Club, and that’s the justification given by the organizers for not being able to take the group to places of real value. First of all, MQM has lost its ability to paralyze the city completely with a strike. Gone are those days. That means if one area is strike affected, there will always be places which aren’t. Secondly when you’re planning something of this nature in a volatile city like Karachi, you always contingency plans. Not just a B plan, but a C and D plan. Finally, when you’re organizing an event for the fourth time, surely you would have learnt something from the past experiences and not repeating the same mistakes. All in all, the 4th Karachi Photo Walk was a big letdown for the enthusiast photographers, and herein lies an opportunity for an entrepreneur to organize a walk that avoids the mistakes of this organizer and provides a memorable experience if not for the rookie then at least for the enthusiast photographer. It doesn’t matter if the ticket is for Rs.700, Rs.1500 or even Rs.2000, all those that were participating could surely absorb the price hike. All they want is a proper management of the event.